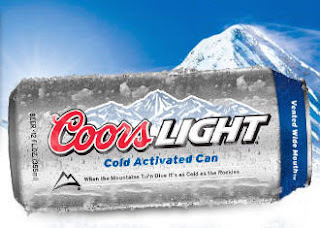 Coors Light's latest gimmick to get people to buy it is a "cold activated" can. Are Coors drinkers so dumb that they cannot figure out when a can of beer is cold enough to drink, or has Coors become such a technologically advanced drink that only it knows when it it sufficiently chilled? What is getting activated by the cold? In either case, I'm staying away. Funny. That's how you cry out in pain, only you're not quick enough to think a good recovery like that. if you got pretty drunk and feel numbness in your hands and cannot distinguish cold from warm you will have a visual indicator, and you wouldn’t get poisoned by the warm beer.